Annual Student Exhibition May 23–July 27, 2014 Opening reception: Friday, May 23, 6 p.m. The Studio School’s Annual Student Exhibition is a juried selection that celebrates outstanding student work from all departments. 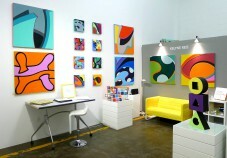 @ ArtStudio Kelyne Reis Galeria Regina 2nd floor, 1716 Richmond Av., Houston, TX, 77098. “50 PAINTINGS, ONE YEAR & A BIRTHDAY” is a one-year project started on February 21st. 2013, day I turned 49. THE 29TH. ANNUAL INTERNATIONAL EXHIBITION – University of Texas at Tyler. New works, part of the new series “Digital Embracing” (working title), are on display. Also works from previous series can be seeing in my new ARTstudio.